The total solar eclipse itself happened. The spring equinox, which is the day of the year when the sun crosses the equator northward and the lengths of day and night are approximately equal. The moon made its closest approach, which was close enough for it to be categorized as a supermoon. The new moon of the eclipse will wax into the very full moon that will become the third blood moon of the current blood moon tetrad, which is a rare thing itself. The new year. The fact that the solar eclipse, and thus the astronomical new moon, occurs on the spring equinox means that the first visible crescent of the moon definitely occurs after the spring equinox. This means that it begins the 1st month of the biblical year, which always begins on or after the spring equinox. As various groups observed and reported, the first crescent was visible with the naked eye on Saturday night, March 21, which makes that night and the following day, March 22, the first day of Nissan. The Passover moon. The 14th day of the 1st month, April 4, is Passover. This coincides with the full moon and lunar eclipse which makes the third blood moon of the current tetrad. The barley ripeness. The biblical year can be delayed one month, in cases where the barley is not ripe enough yet. As has been reported, mature barley was found around Jerusalem, so the 1st possibility for beginning the year has been confirmed as official. These calendric coincidences draw attention to the fact that God uses the sun and moon for signs. They were created for that purpose but are not to be worshiped. Satan, in the form of the sun god or the moon goddess, solicits worship through the sun and moon. This total solar eclipse followed by the lunar eclipse show that God will likewise blot out Satan in all his forms, as well as those whose allegiance is with him. If you don’t yet know who Satan is, he is unmasked here. Isaiah 13:10 states that the sun shall be darkened “in his going forth.” The sun goes forth every day when it rises in the east, making its journey across the sky, and finally setting in the west. Did this solar eclipse occur “in his going forth”? Yes, the news media was full of reports of the “morning” eclipse, which began at sunrise in the North Atlantic Ocean. Furthermore, the verse links the dark moon with the dark sun, which is exactly the situation of this eclipse of the sun, which leads to an eclipse of the same moon once it becomes full about two weeks later. Other similar prophecies (e.g. Joel 2:31) make specific mention of its appearance as a “blood” moon. 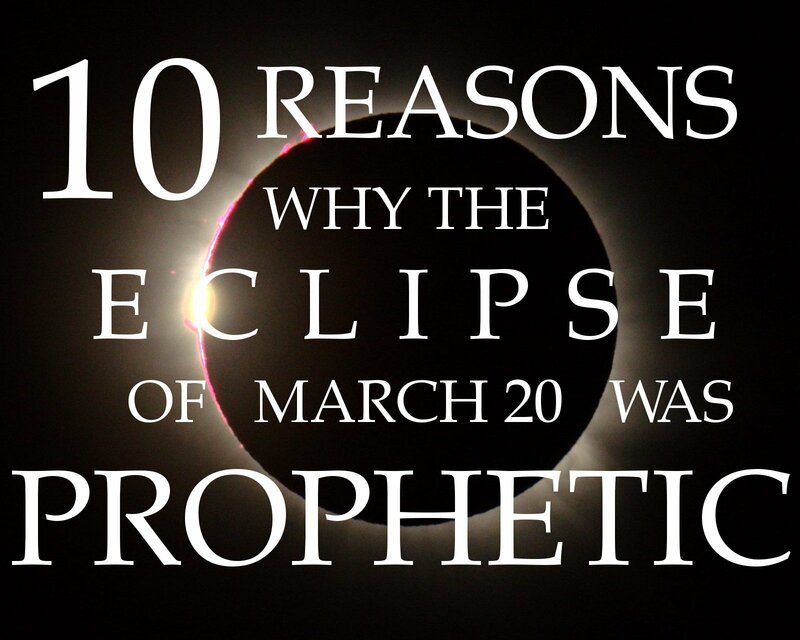 Although there have been similar eclipses in the past, these criteria have never all been completely fulfilled since Isaiah’s words were recorded, until now. However, that is still not all! The same as H3684; any notable constellation; specifically Orion (as if a burly one): - constellation, Orion. There were no news reports of stars or the Orion constellation “not giving their light” in connection with the solar eclipse, so what could this prophecy of Isaiah mean? It must have a symbolic application, unless we are prepared to wait untold millennia for these “fortuitous” circumstances to return again, combined with a darkening of the stars of Orion. The wise of Daniel 12:3 are not giving their light. The Orion message is not giving its light. While this is a sadly accurate prediction of present reality, the statistical impossibility of all of these criteria meeting together in this solar eclipse still makes it one ultimate confirmation that “the day of the Lord cometh,” and that now it is time for all to come out of Babylon, who don’t want to receive of her plagues. Is your little light shining? Are you leading others out of Babylon? As darkness covers the earth, it’s your time to rise and shine!